I’m still having a hard time to find enough time to myself to read as much as I’d like to, but with my husband finally starting all-day rehab this week, we’re settling down in a new routine and the boys have been reading a lot of books every day so I can’t complain. I’m about to finish The Innocent by Harlan Coben, a murder mystery I have to read for my February book club meeting. I’d never read anything by Coben until now but I understand he’s quite famous and prolific in this genre. Although I’m not done with the book yet, I really like it so far. I was concerned about the many characters and how they would all come together since they seemed so disconnected, but Coben is tying things up nicely and I like how he takes time to develop each character. And of course there is a lot of suspense, murders and twists. I definitely want to read more of him and I think I’ll start with Tell No One, which was made into a French movie a couple of years ago. Nothing new since I’m finishing up The Innocent this week. The Magician (The Secrets of the Immortal Nicholas Flamel) by Michael Scott, the sequel to The Alchemyst: The Secrets of the Immortal Nicholas Flamel, which I enjoyed reading a few months ago. My two kids start school 30 minutes apart every day, so after I drop off my five-year old, I go back to the car and read books with my three-year old, enjoying some nice, quiet reading time together. His favorite book to read in the car this past week has been Richard Scarry’s What Do People Do All Day. – Cornelius P. Mud, Are You Ready for Bed? – Cornelius P. Mud, Are You Ready for School? – Cornelius P. Mud, Are You Ready for Baby? 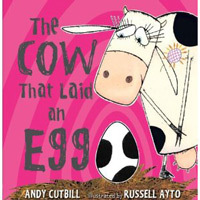 They’re not as funny as her Click, Clack, Moo book series where farm animals blackmail the farmer to get what they want, but we still like them. I’ve ordered some new books from the library but they’re a little slow to come in. Fortunately we still have plenty of unread books to keep us entertained until then. With a three-day weekend and school starting, our reading habits have been moved around but we still managed to read some good things this past week. 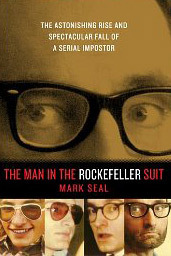 The Man in the Rockefeller Suit by Mark Seal. What a fascinating story about a pathological lier who managed to create rich characters for himself, sucking the money out of real rich people and living off them until he finds a better deal. There’s even a story about an unsolved murder this crook may have been involved in. I can’t wait to see what else he can come up with! This is “Catch Me If You Can” with a very disturbing twist. 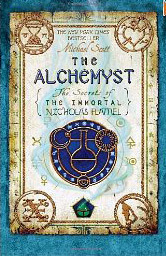 The Alchemyst: The Secrets of the Immortal Nicholas Flamel by Michael Scott. I liked this book, even though I didn’t realize it would end in a cliffhanger and I now have to read books 2 and 3 (I hope that’s it!). It’s like a mix between Harry Potter because of all the magic, and The Da Vinci Code because of the various divinity references. 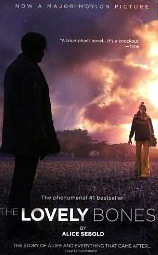 This was an easy read, even though it was hard to put the book down at the end of a chapter, and I enjoyed the vivid descriptions that helped me visualize each setting in my mind very clearly. I recommend this book to anyone who likes this genre. Good Enough to Eat by Stacy Ballis. I have to read it for my next book club meeting at the end of September. Again, probably not a book I’d pick on my own, so it should be a nice change of pace. We discovered two new book series (new to us) this past week and my boys really like them. 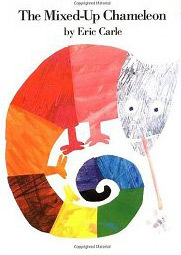 They are very suitable for kids between 3 and 6, to read with someone or on my own. – Fancy Nancy by Jane O’Connor: this eccentric elementary school girl takes you inside her classroom and out in the world, teaching you new vocabulary words along the way. What happens to her feels very real and it helps kids relate to her (even if they are boys!). So far we’ve read Fancy Nancy at the Museum and Fancy Nancy: Every Day is Earth Day. We’ll definitely had to get more of them at the library. – Oliver Pig and his sister Amanda Pig by Jean Van Leeuwen: fun books about a brother and his sister having everyday adventures. My kids ask to read the books we have at least once a day – I see it as a good sign. – Actual Size by Steve Jenkins. What a great book to learn more about animals. Each page spread pictures an animal or part of an animal to show you how big they are. Warning, there are so pretty gross pictures of insects and arachnids in there, but kids dig it. – What Is That? Said The Cat by Grace Maccarone. 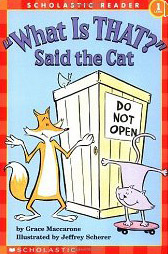 Funny book full of short rhymes for emergent readers. It will teach kids a few things about being too curious too. We’re getting a whole bunch of the “Fly Guy” books by Tedd Arnold so I’ll highlight some of them next week.